Is the in-its-entirety album concert a gimmick or a kindness? 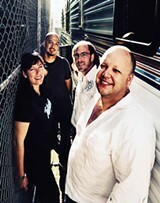 In June 2009, college-rock darlings the Pixies made an announcement that thrilled aging indie rockers. The band would commemorate the 20th anniversary of their release Doolittle with a tour featuring a live replay of the album in its entirety. For a band who hasn't hit the recording studio since 1991, the buzz around the Doolittle tour was tremendous, with people clamoring to see the band perform their most beloved album. According to the Pixies' publicist Holly Ellen Robinson-Fitzgerald, ticket demand for the Doolittle tour is even bigger than the Pixies' initial 2004 reunion tour. "It took about an hour for London's 20,000 and Brussels' 8,000 tickets to be grabbed up, while all 2,600 tickets for the two-night stand in Dublin were gone in under two minutes, causing a third show—also sold-out—to be added," she stated in a tour press release. "At this stage of the game, we're not trying to reinterpret the music," Black recently explained to the website Music Radar. "We're more about replicating records and replicating certain expectations rather than getting all jazzed about it." As more and more bands announce the performance of entire albums live, the question arises: Is this an artistically motivated attempt to recreate an emotionally compelling creation, or is it an easy way to get fans to plunk down hard-earned cash for sold-out shows? The list of big-name acts performing old albums in their entirety continues to grow. In September, Bruce Springsteen treated Chicago fans to a reprise of Born to Run in its entirety. This past spring, Mötley Crüe celebrated the 20th anniversary of their glam-rock classic Dr. Feelgood with performances of the album. The Melvins dusted off their most accessible album Houdini for a short tour in 2008. The once stage-shy Steely Dan plans will perform Aja as well as The Royal Scam during select October tour dates. Devo recently announced a plan to play back-to-back nights of Q: Are We Not Men? A: We are Devo! and Freedom of Choice, revisiting the pinnacle of their career success. Like the Pixies, some of these artists have not written a new song in years, but that hasn't stopped them from "giving the people what they want," which seems to be recycled tunes sung in a new era. Fans are torn on the issue. While some have rushed out to buy tickets, others view the albums-in-their entirety tours as a money-making grab. One particularly virulent commenter on NPR's All Songs Considered blog grumbled that the Pixies should get back together for real, record a new album and tour with new songs or "hang it up." So when exactly did the concept of performing an entire album live from start to finish begin? Barry Hogan, founder of All Tomorrow's Parties—a yearly music festival curated by different artists—has publicly claimed responsibility for the trend, saying it began in 2004 with the Stooges playing Fun House for his festival's successful, ironically named Don't Look Back series. Don't Look Back has attracted numerous artists. In 2008, Public Enemy dusted off It Takes a Nation of Millions to Hold Us Back. While at first reluctant to revisit the political-rap opus, they embraced the concept and ended up playing the album on tour. Cat Power has performed her complete melancholy gem The Covers Record at ATP, while Sonic Youth treated ecstatic fans to their epic guitar-noodler Daydream Nation during a 2007 tour. But what about the potential dark side to the trend? How many bands are going to jump on the bandwagon before it overflows with the scary prospect of MC Hammer breaking out the gold pants for a reprisal of Please Hammer Don't Hurt 'Em? Matt Breece, a long-time fan of the Cult who owns copies of their album Love on CD, vinyl and cassette, had no qualms about buying a ticket for this summer's performance of the album in San Diego. He also doesn't think there's cause for concern regarding the avalanche of bands playing entire albums live. "I knew exactly what to expect as far as set list was concerned. I wouldn't have gone if I thought they were playing a mix of new and old material," he says. "Playing an entire album guaranteed I won't have to listen to a lot of new songs that weren't that good." Rather than seeing the tour by a nostalgic favorite as a grab for money, Breece has a different take on the albums-in-their-entirety concept: he believes that the art of the album is being lost. "We increasingly live in an iTunes world where people listen to just a couple songs by an artist and rarely listen to a full album from start to finish. An entire album can have the arc of a novel or a film, being a complete artistic piece," he says. "It's nice to listen to the performance as a complete piece rather than a greatest-hits shuffle. It revitalizes the album as a work of art." Other fans have loved seeing albums in their entirety strictly for the nostalgia factor. Last year, Liz Phair celebrated the 15th anniversary of her most critically successful album, 1993's Exile in Guyville, with a series of performances. Jessica Duran of Sonoma County was at the San Francisco show, and for her, being transported back in time was one of the night's most enjoyable factors. "It was fantastic! Like a time warp, I couldn't have dreamed up better," Duran says. "Liz was all denim cutoffs and ripped tights, just like the days when her album came out. It was like she recreated her entire early '90s self, and it was perfect." To Duran, seeing Exile in Guyville allowed fans to remember the Phair that they had loved years before, rather than the major-label singer who went on to sing radio-friendly hits. "It was definitely a way for her to revisit and reconnect with her early success, before she 'jumped the shark' and started singing cotton-candy lyrics," Duran says.With tickets selling for upwards of $50&–$70 for most in-its-entirety tours, there's something to be said for knowing exactly what one is getting into. When the Pixies play Doolittle, everyone will know that "Bone Machine" will be followed by "Debaser." The spontaneous glory of impulse and improvisation, in a way, might be lost to the comfort of the expected, the backward fall into nostalgia's warm embrace. It can be fun to remember old times, but like the high school quarterback after school is out, there's a danger in relying too much on past glories. As long as the money rolls in and the crowds continue to yearn for the oldies but goodies, bands will be content to do just that—in its entirety.